Are the weapons real and are they loaded? Yes and yes. Impressive that these are real soldiers and well trained, and when not guarding the Queen, they’re deploying with their units around the world. Many of them have had combat tours. And the weapons you see are real and loaded. They aren’t at the palace just for show. At the beginning of a guard’s tour of duty, he is told the following: "You may not eat, sleep, smoke, stand easy, sit or lie down during your tour of duty". The second step is to move his weapon into a ready position. In the third step, he will point his weapon. Following that, the next step is to signal for help (there’s a button inside the guard station), or detain the person himself. That seems to be all that is needed. 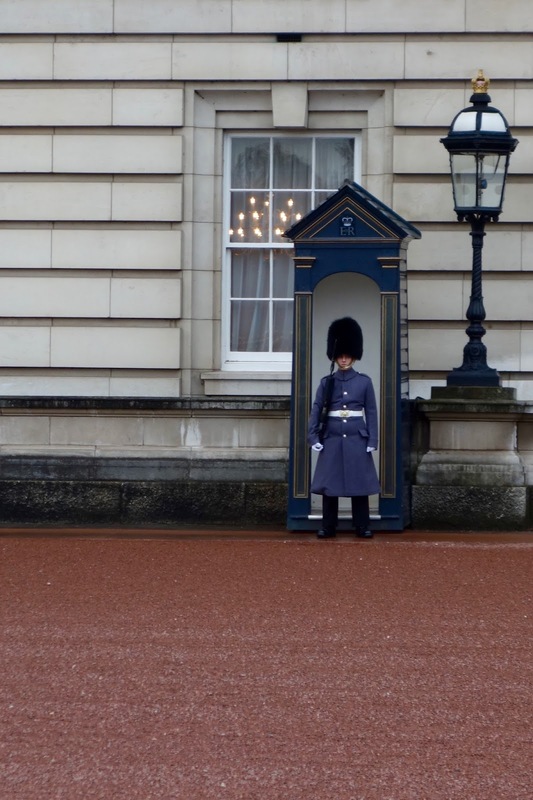 To date, no weapons have been fired while on duty at Buckingham Palace. 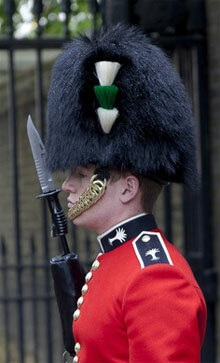 What about the bearskin caps? Real or fake? REAL, made from Canadian black bear skins. Cost is exorbitant: £1,224 (2016 price), or about $1555.45 each. Are animal rights folks going crazy? Yep. Have the British backed off? Nope. Still, bearskin may be on its way out after a couple of centuries of tradition, not because of animal rights, but because of cost. My observation is that from the beginning of recorded history, economics have played a more important role in change than any other single factor, whether the topic is “the divine right of kings,” the rise and fall of dictators, who wins an election, or the cost of bearskin caps. What about the bands? 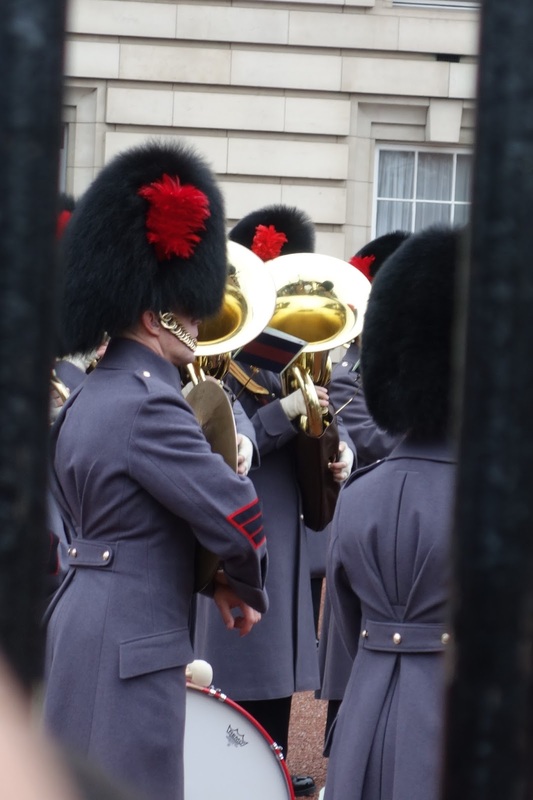 Each regiment has its own, except for the Household Cavalry regiments, who only have one combined band. They march from Wellington Barracks to the palace for the ceremony. In the Changing of the Guard, normally two bands play, one for the oncoming regiment and one for the retiring regiment. 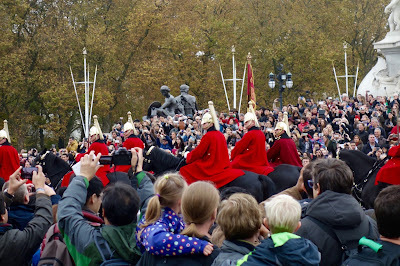 The cavalry rides from the nearby Hyde Park Barracks. Cavalry? Really in the 21st Century? Yes and no. When not guarding the monarch, the Household Cavalry Regiment (HCR) horsemen are also ‘real soldiers’, serving in their operational role as a Formation Reconnaissance Regiment, riding in armored fighting vehicles. Things to know about the Cavalry: The horses are known as Cavalry Blacks and stand at least 16 hands high (5 1/3 ft or 64 inches). No stallions and most are geldings. In the 1982 Hyde Park Bombing, four horsemen and seven horses were killed. On their ride to Buckingham Palace, the Household Cavalry salutes the monument. Want more? Juliet Blaxland has written a book on the horses, titled: Nimrod, A Cavalry Black, from foal to retirement, with part of the proceeds going to The Household Cavalry Foundation charity. Yes, there is a lot more to know, but you already know more than 99% of the folks who view The Changing of the Guard at Buckingham Palace! Relax, enjoy the music and the ceremony and the pageantry that has been a part of British history for hundreds of years. As a side benefit, here’s a free mental check on your short-term memory. If you fail this quiz, put down that bottle, sober up and try it again. That right, he's a Welsh Guard. And from which regiment are these red-coated Cavalry? The Life guards, of course. Check this photo. 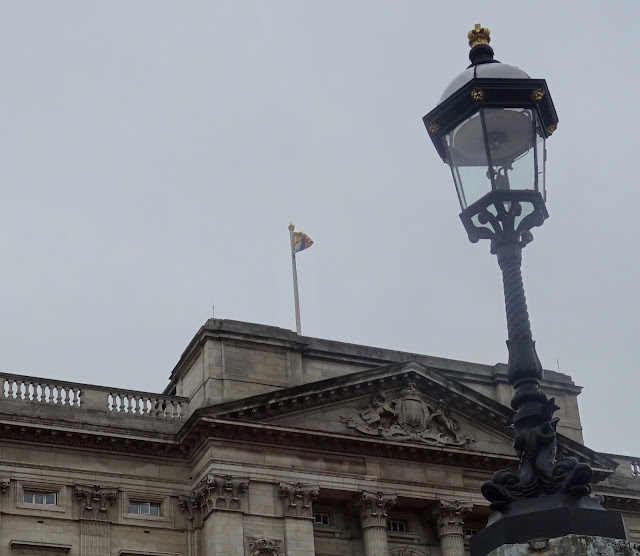 Is the Queen in residence? You bet she is! Another way to tell? 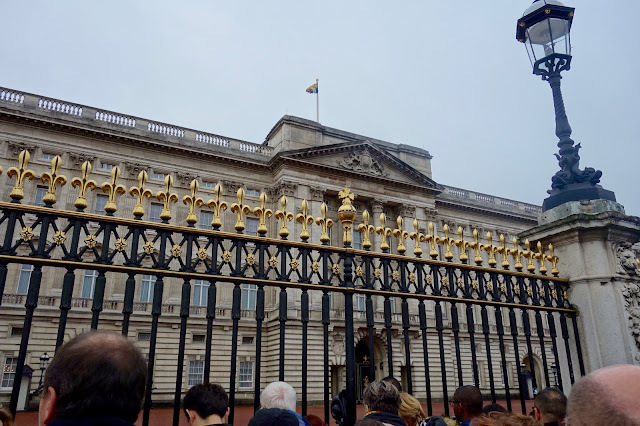 Four guards in front of the palace, she's there. Two guards means she's not.